As predicted, August marked the rebound from the seasonal effects experienced in the previous two months. 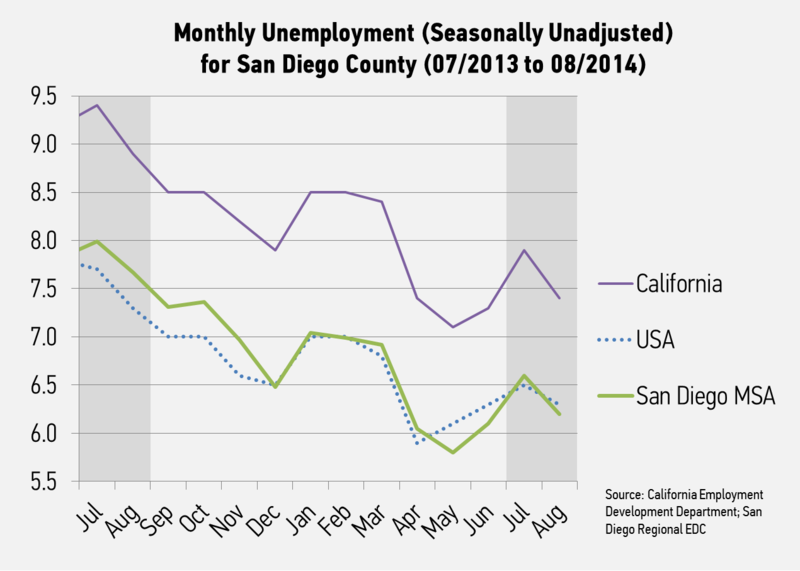 At 6.2 percent, San Diego’s unemployment rate fell in August by 0.7 percentage points from July. In addition, unemployment was down 1.5 points from August 2013. San Diego’s unemployment rate was lower than the California average, and returned below the U.S. average. The region gained 3,500 jobs from July to August, and added 34,200 jobs since last year. 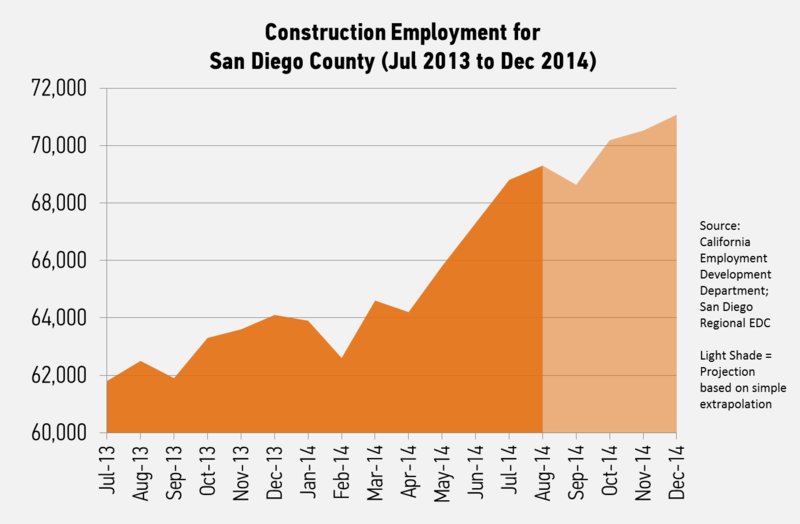 A booming construction industry added 6,800 jobs since August 2013, a more than 10.8 percent increase over the year. The manufacturing industry added 2,200 jobs since the previous August. Staffing services grew by more than 2.5 percent since last year, indicating demand for hiring services. 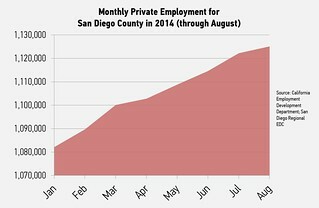 San Diego’s traded economies continued to drive much of the monthly and annual employment growth. The California Employment Development Department (EDD) released statewide county employment data today for the August 2014 period. 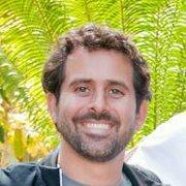 At 6.2 percent San Diego County’s unemployment rate dropped 0.7 points from July to August, and fell by 1.5 points from this time last year. The unemployment rate in the region remained lower than California’s average, and returned to below the U.S. average of 6.3. As predicted in previous monthly reports, August began the seasonal decline of the unemployment rate. 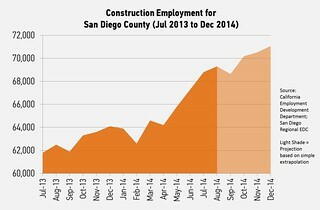 However, unlike the U.S. jobs report released earlier this month, August’s decline in San Diego was not driven by a lower labor force. 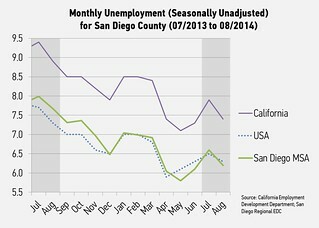 In fact, San Diego’s labor force increased by 5,500 from July to August, as 6,600 less people registered as unemployed. 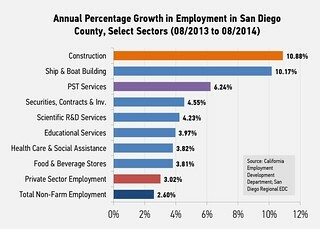 When looking at employment growth, we’ve continued to see positive signs of steady growth, particularly in San Diego’s private sector. From July to August, the region added 3,500 jobs, more than 82 percent of which came from the private sector. The private sector added 2,900 jobs from July to August, a sign of continued economic growth. When looking at overall growth since last August, the region’s economy added 34,200 jobs, a 2.6 percent increase. Meanwhile, the region’s private sector grew by more than 3 percent over that period. With unemployment down and the economy consistently adding jobs, it appears as though many job seekers are finding landing spots as the economy continues to improve, and much of the growth is in middle-to-high paying industries. 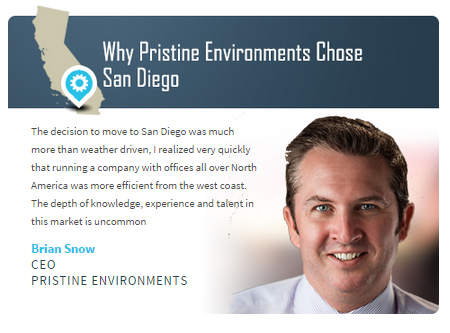 San Diego’s traded economies continued to drive much of the region’s employment growth. Professional, scientific and technical services (PST), heavily associated with innovation, added 1,600 jobs since July 2014, which accounted for more than half of private sector job growth since July. PST added 7,800 jobs since August 2013, for an annual growth rate of an impressive 6.2 percent, well above the economy-wide average of 2.6 percent. PST includes subsectors like scientific research and development, which is a key driver of our life sciences. This subsector grew by more than 4.2 percent over the year. 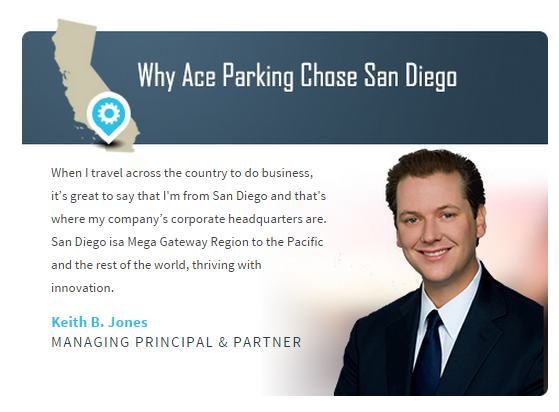 San Diego’s tourism industry began its seasonal decline, losing 2,700 jobs from July to August. However, the industry added 3,600 jobs since August 2013, indicating that the industry is still performing well. Health care and social services was another major contributor, adding 5,700 jobs since August 2013. Combined, PST, Tourism and Health Care accounted for more than half of the region’s annual private employment growth. 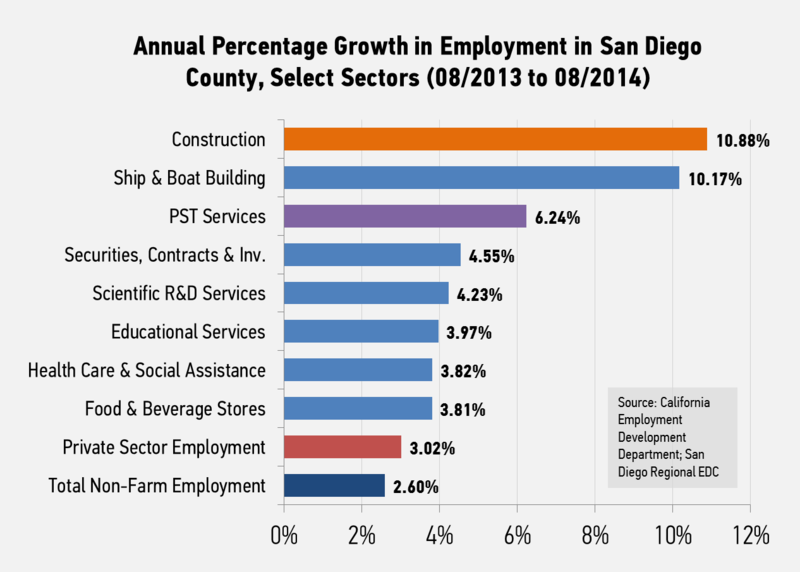 San Diego’s goods producing industries continued their steady employment growth. Manufacturing remained flat from July to August, but added a total of 2,200 jobs since August 2013. Meanwhile, the construction industry continued to boom. The industry added 500 jobs from July to August and 6,800 jobs since August 2013, for an astounding 10.9 percent annual growth rate. Combined, the manufacturing and construction industries accounted for more than one quarter of private employment growth from 2013 to 2014. The August employment report confirmed that much of the negativity that we saw in June and July were simply seasonal effects and not indicative of any negative trend. The recession is clearly in the rear-view mirror and has been for some time. 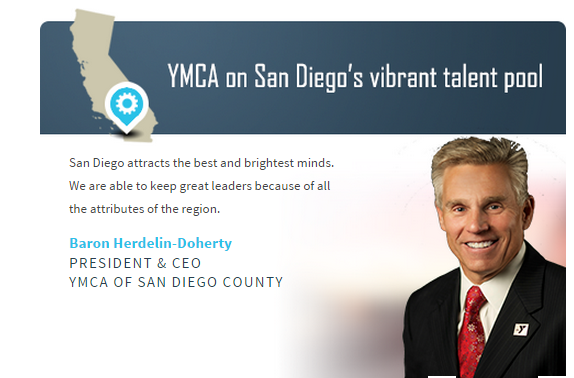 May 2011 was the last month in which San Diego didn’t record a year-over-year job gain. We haven’t even experienced a month-to-month loss in private employment in 2014, an indication of how steadily the economy has been growing so far this year. Finally, the unemployment rate declined as a result of job-seekers finding employment, not job-seekers leaving the labor force, an important sign of a healthy regional economy.